木柵mu4zha4 MuZha isn’t a particularly popular or common place for westerners to go in Taipei, unless it’s to go to the zoo. Taipei Zoo is located around the MuZha area, and also if you’re scooting up to 貓空 mao1kong1 MaoKong then i’d recommend you to take the road that goes through MuZha – for the scenery! Anyway, we went over to MuZha after hearing about this breakfast place. 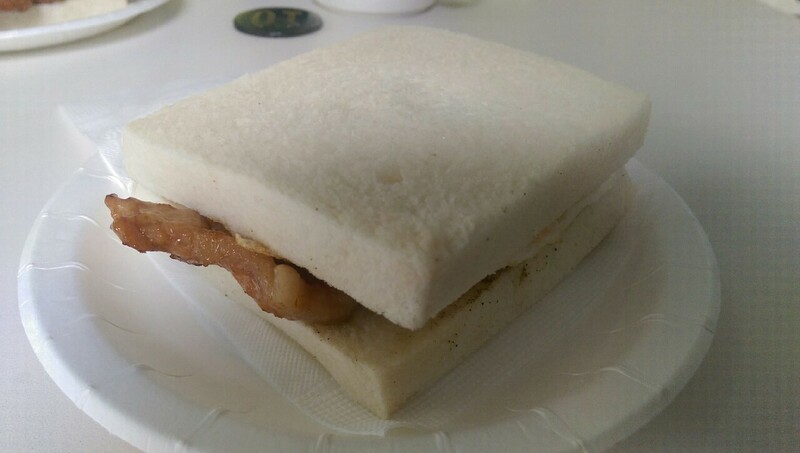 The sandwich looks so plain, but I’ve heard its delicious. It’s almost like it looks too plain, so what’s all the fuss about? It was quite busy on arriving – each table was full. We waited for a few minutes and then got a seat outside, but the atmosphere was quite hectic. Lots of people were coming in to get food to take-out. So we at least had that fact going for us. You should first find a seat, then get a menu and go up to order. We made the mistake of ordering without having a table (thinking that they would assign us to a table, but they didn’t. It was kind of a see-it, take-it). The menu is fairly typical of most breakfast shops. 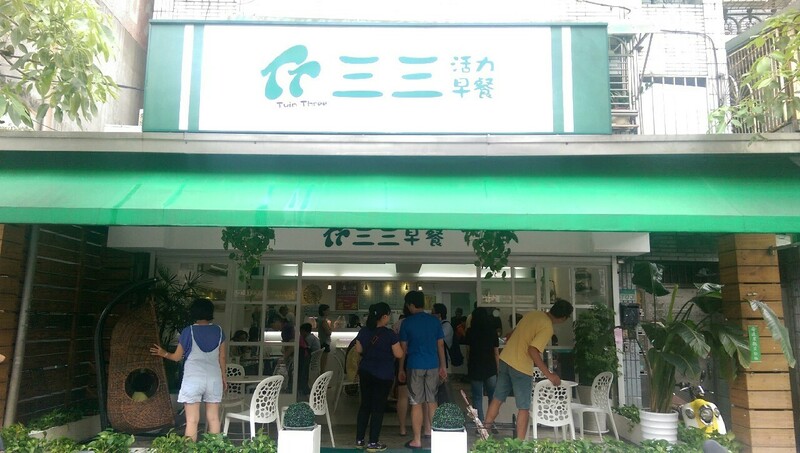 You have the classic: 土司 tu3si1 toast, 蛋餅 dan4bing3, 單點 dan1dian3 a la carte, 熱飲 re4yin3 hot drinks, 冷飲 leng3yin3 cold drinks and finally 其它 qi2ta1 others section. When it says toast here, it really means sandwich. So don’t expect a couple of slices of toast, buttered and then topped with something. Expect a sandwich. The cross-section is looking better, in comparison. From the top down we have bread, slice of cheese, fried egg, flat slice of pork and then another slice of bread to form the sandwich. 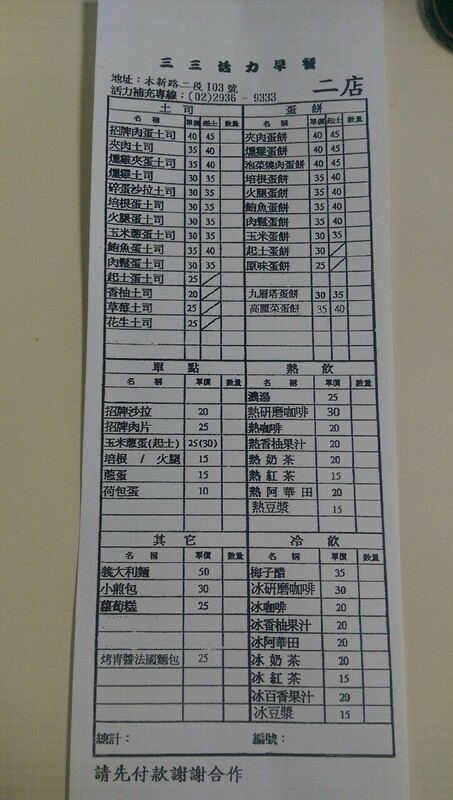 For the cheese option you just circle the 45 where at the top of the menu it says 起司 qi4si1 Cheese. If you don’t want cheese, just circle the 40 where at the top of the menu it says 單價 dan1jia4 for just the sandwich. From the outside it looks like a fairly standard 蛋餅. 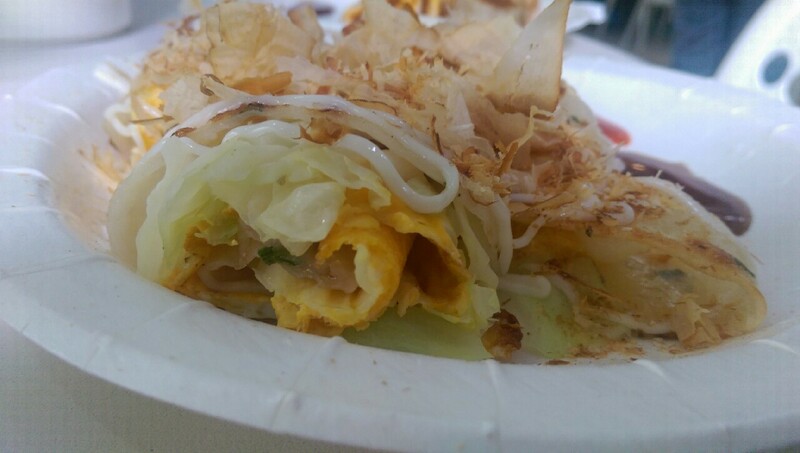 On the inside, we can see a layer of cheese, egg and kimchi pork. The pork has clearly been marinated in the kimchi for a little while, and then some of the kimchi has been put into the 蛋餅, too. It maintains a strong chilli and garlic flavour, and the thin pancake keeps it all together nicely. The cheese is always a good addition to a 蛋餅 and I strongly advise it here, too. 3. 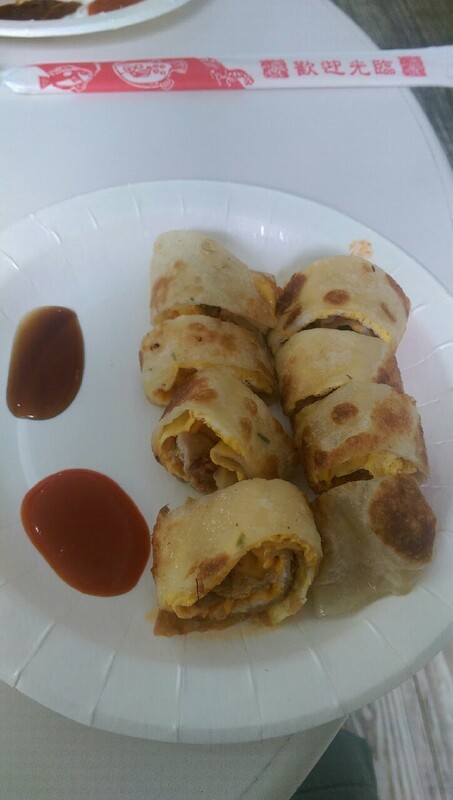 高麗菜蛋餅 gao1li4cai4dan4bing3 Cabbage and egg pancake roll. It’s pretty weird to look at, but don’t worry, its just wafer thin shavings of squid. 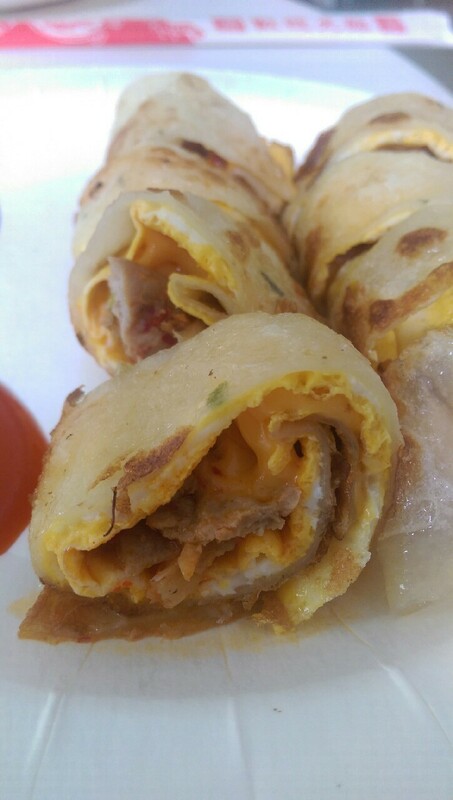 You can also see the thin squirting of sweet Taiwanese mayonnaise resting on top of the pancake roll. 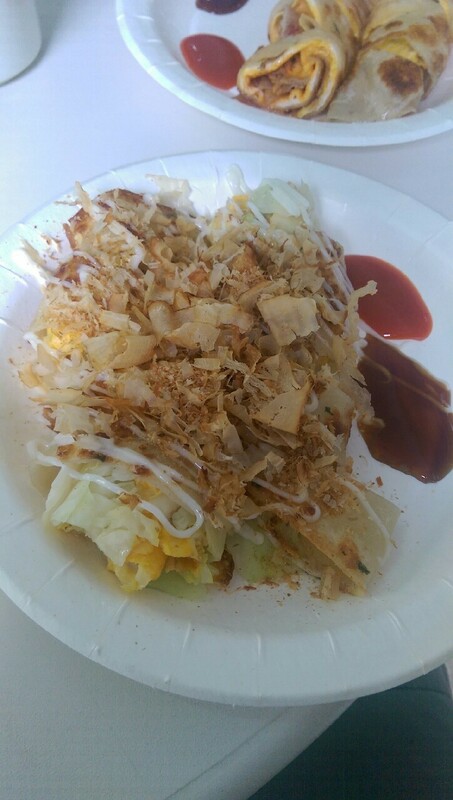 I guess it was a bit of an odd thing to have on a menu – cabbage and egg pancake roll. So we got it, because we were intrigued. It was a pleasant surprise to see it topped with the wafer thin shavings of squid. This gave it an extra flavour and an extra dimension. The cabbage inside was plentiful, it was fresh and it had a good flavour. The egg complimented the cabbage well and the whole dish tasted fresh and light. Usually when you order the 蛋餅, it tends to be quite soft, quite chewy and quite dense. This one wasn’t, the flavour had been thought of properly and the ingredients were all put together very well. Overall, I think if you’re in this area for breakfast then I would strongly recommend this place over any of the chain breakfast stores such as My Warm Day or Breakfast Time. With nothing particularly against those stores, this one just does similar dishes, but much better taste and quality. Best dish: 1. 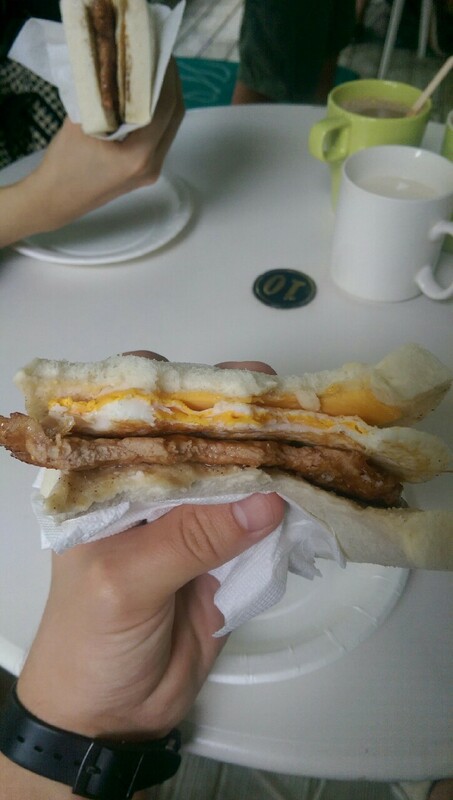 招牌肉蛋土司 zhao1pai2rou4dan4tu3si1 Speciality ham and egg sandwich – it was filling, it was hearty and it was remarkably simple. The ingredients all worked well and the taste was very satisfying for a breakfast sandwich. Dish I wouldn’t order again: I’d order all dishes again. This breakfast shop was so popular that they created a second shop, on the same road, just a few places down. We actually went to 1., whereas the original one (2,) is just up the road.